Friends of Jesus are people who endure life’s trials with the Lord’s strength. Jesus tells us in Mat 10:22 we “will be hated by all for [His] name’s sake. But [the one] who endures to the end will be saved.” The question is often asked, why do we suffer? Why is this happening to me? Jesus tells us that people will hate us because we’re friends with Jesus. And as a friend of Jesus you will be hated and you will suffer even thou you are doing the right thing (1 Pet 2:20) but this is commendable before the God. And the promise is that if we endure life’s trials then we will reign in heaven with Jesus. But if we deny Jesus during our trials, then He will deny us before God (2 Tim 2:12). If we’re friends of Jesus then we will endure the trials of life, we’ll lay hold on the promise of victory to those that overcome with patience. 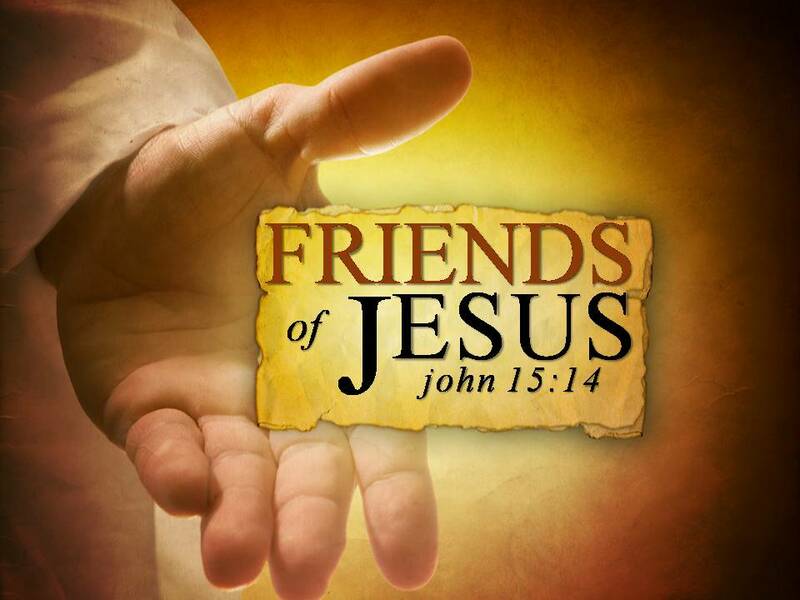 Friends of Jesus are people who are neighborly to all men not just to those who are like them. Is this not the meaning of the parable of the Good Samaritan? (Luk 10:25-37) In this passage Jesus affirms that if we want to inherit eternal life then we love our neighbor as love ourselves (vs. 27). He then uses the parable of the Good Samaritan to show us that our neighbor is anyone who is in need of anything, not just those who are like us, or we might say not just those who are Christians. As we have opportunity we are to do good to all men, to the sinner and saved (Gal 6:10). Because if we only do good to those of the “household of faith” then we are not like our Father in heaven. The Father does good not only for the saint but also for the sinner (Mat 5:46-48). The Father is the true neighbor because He does good for all men and if we want to be like Him then we are called to do the same. If we’re friends of Jesus then we will be neighborly, not only to the saints, but to all men. Friends of Jesus are people who are not only hear His word but they are doers of His word. At the conclusion of Jesus’ Sermon on the Mount the text tells us that “the people were astonished at His teaching, for He taught them as one having authority.” (Mat 7:28b-29a) He had taught them a whole catalog of commandments from hating one’s brother, to the marriage relationship, to loving enemies, to praying, to not worrying. But He ends His sermon by saying that those who hear His words and do them are wise men whose life will be able to withstand the storms of life (Mat 7:24-25). But to those who only hear and do not do they are fools whose lives will crumble and their souls will be washed away (Mat 7:26-27). If we’re friends of Jesus then we’ll be doers of His word not merely knower’s of His word. Friends of Jesus are humble servants to God and to others. We know that Jesus said in Mrk 9:35 that if anyone will be first in the kingdom he must be a “servant of all.” The reason that Jesus can so confidently call us to a life of serve is because His life exemplified serve to His friends. Paul reminds us that Jesus came in “the form of a bond servant” (Php 2:7). Jesus wants His friends to be servants to all just as He was. Paul also says that we are to “count others as more significant than ourselves” and to “look out for the interest of one another.” (Php 2:3-4) These are the things that servants do. These are the things that friends of Jesus do for each Him and for each other. Because they are the ways that Jesus has already served us. If we’re friends of Jesus we’ll be servants just like Him. The question for you this, are you a friend of Jesus? Are you doing whatever He commands? If not then sadly you are no friend of Jesus and on the day of judgment he will say to you, “I never knew you, depart from Me.” (Mat 7:23) But you can change that today by obeying His commands and becoming His friend. I would love to hear from you on your journey of being a friend of Jesus. Drop me a line at clay@claygentry.com and tell me your story.